Captured on Saturday April 20, 2013 at 4am, south of Big Sur, California. To buy a high-quality print of this image, click here - you'll see a newer photograph - similar but different - of this place. To get THIS photo, write in the comments "Please Print 2013 Version" when you place your order. gorgeous photo, gorgeous website! thanks for sharing! This pic made APOD 5/7/13! It's so beautiful! This is a wonderful image! Thanks! Beautiful photo! 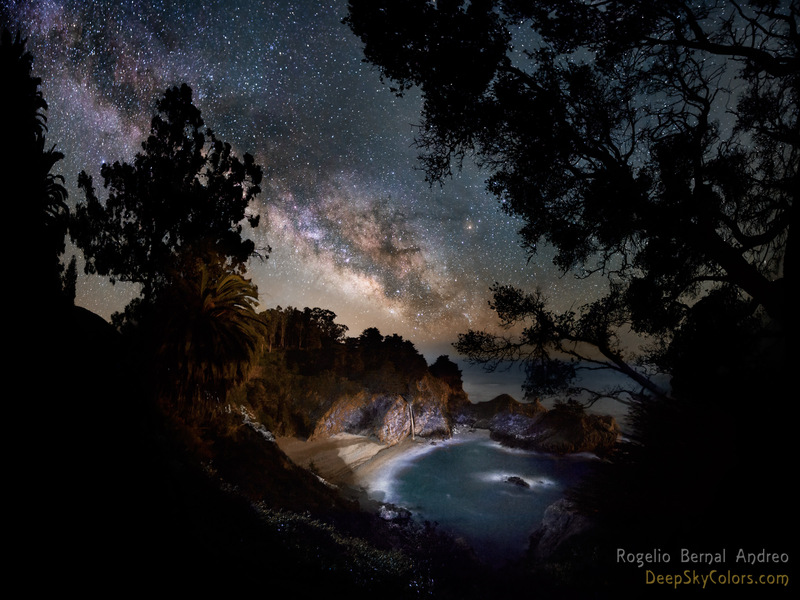 I love Big Sur and the Milky Way, so a picture of both is a treat. One question: there seems to be moonlight coming from the West / right side of the image, but on April 20, 2013 the Moon had already set by 4:00 am. If that is moonlight, I'm surprised you were able to get such a good picture of the Milky Way on a night when there was a waxing gibbous Moon. No star trails, but a crisp foreground as well so it doesn't appear to be on a tracking mount. Interested in what the image data for this shot was, mainly the exposure time? BTW, the composition of this sot is great! Really like the Milky Way alignment with the gap in the foliage. Craig, your words are almost overwhelming, what can I say? Jim, the exposures were all 30 seconds (as you said, on a tripod, no tracking). With a 20mm lens, 30 seconds barely produce any star trails. Anthony, the image integrates data captured during moonset and after moonset, as well as artificial light ("light painting"). Still, it's not very hard to pull data from the Milky Way when the moon is low. My image "Heavenly Melody" (http://www.deepskycolors.com/archive/2013/05/06/heavenly-Melody.html) is all "one shot" (actually an 8 pane mosaic, but all data captured with the Moon already out) and the Milky Way came out just fine - not as obvious as in this image but again, in that image the Moon was right below the MW, not opposite. Also, sky darkness at Lake Tahoe is not the same as in this area of the Pacific Coast. Point being, capturing the Moon and a clearly visible Milky Way is not at all unusual if you have the right conditions. Super nice and very unexpected shot Rogelio. I knew the location immediately, but the exotic appearance of your photo really made me stop and admire what you had created. You've provided a very fresh look at a much photographed location. That takes imagination and skill. Well done. Beautiful setting and a grand image. Thank you for sharing your images. This is one in a million/billion! Most beautiful image I have ever seen! Would like to purchase a print but I am confused. The title is shown as "Untouchable beauty"
but when I click to order the title changes to "Mc Way Falls" item #R069. Can some one please clarify. Vincent, it's the same image. Thanks for your response. Wish to order but am undecided on type of print. Framed ,unframed,canvas, unstreached, Fine art textured?? Is there someone I can speak to for advise? this is The most beautiful picture I see in my life, thank you very much. I am awestruck, your work is absolutely incredible! Two views that remind me of the majesty of creation, beauty of the Heavens and Earth! Hi, really love the colours and composition of this photo and would like to have a copy. However, the link with the text "To buy a high-quality print of this image, click here " does not go to the correct image, it shows the same place but was taken at a different time. Matthew, I contacted SkyImageLab and they said you can order on that page and in the comments write "Please Print 2013 Version" to get this particular image and not the "new" one.